The U.S. Senate voted 72 to 27 last week to confirm billionaire investor Wilbur Ross as Commerce Secretary. 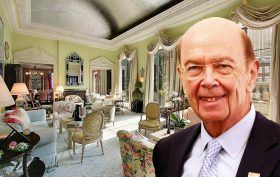 And now that he’ll be busy renegotiating the terms of Nafta and defending allegations of his questionable ties to Russia, the “King of Bankruptcy” is ramping up efforts to sell his ostentatious Billionaires’ Row penthouse. Curbed reports that the 14-room, “European-style” apartment first hit the market in 2015 for $21 million, then got a price chop to $18.5 million at the end of last year, and has now been reduced again to $16.5 million, less than the $18 million he paid for it in 2007.